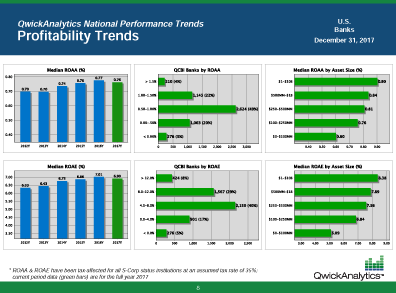 QwickAnalytics is pleased to present a summary of key performance trends of "true" community banks — providing critical comparisons that are meaningful and relevant. 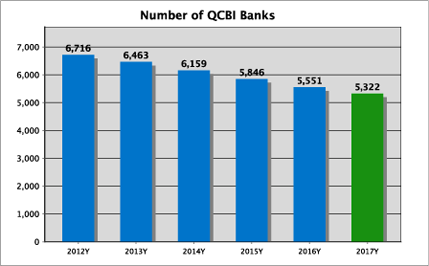 These reports are based on the proprietary QwickAnalytics Community Bank Index™ (QCBI) and include only FDIC-insured institutions that fit the characteristics of a community bank. See more below. What does this mean to your bank? You’ll have concise, useful summaries of key performance metrics to closely track industry trends and competitors each quarter. Better understand long-term trends affecting community banks, so they can compete more effectively into the future. Learn how the true community banking industry is performing and trending – minus large, Wall Street banks that typically skew the comparative data. 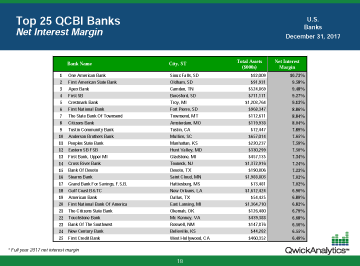 Compare and stack your own bank’s performance against community banks across the nation. Know the top-performing community banks in the nation and in your state. Know your market and your competition. Make these trend reports a standard part of your quarterly management review and routine. 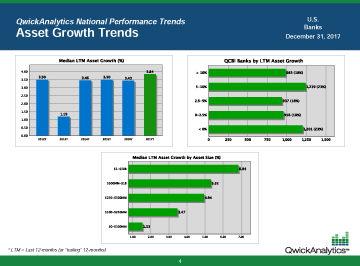 Get performance trends for "true" community banks with the QwickAnalytics Community Bank Index (QCBI). 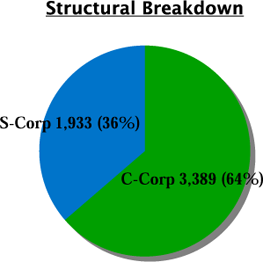 Many of the thousands of banks the FDIC tracks are large or Wall Street specialty banks and thus not relevant to community banks when comparing key performance trends and measures. 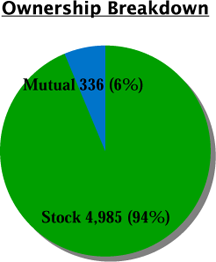 QwickAnalytics has solved this problem with our proprietary index that includes ONLY those banks that should be regarded as "Community Banks" for the sake of comparison. The index is largely based on research conducted by the FDIC ("FDIC Community Banking Study," December 2012) regarding the definition of a community bank, but has been modified to be improved and more relevant. 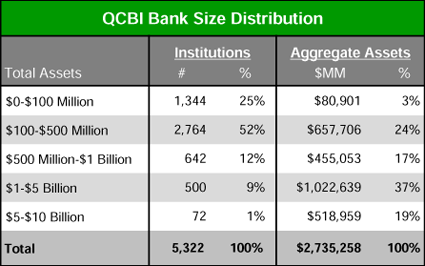 Here is a summary of QCBI banks compared to total FDIC-Insured bank and trust institutions.